Siddheshwar Temple Siddheshwar Temple is home to a figure of the Lord Ganesh in a standing position. 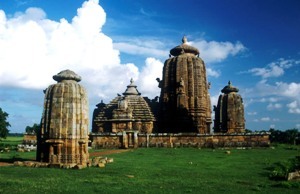 A typical Odisha Temple, it is located in Khurdha District. Interior of the temple comprises a pancha-ratha sanctum with a five-divisional walls. In the upper part, wall is further sub-divided into two registers by the median bands.Consisting of seven mouldings, these walls are decorated with khakhara and pidha-mundis. A row of miniature turrets group the shikhara. These shikhara are surmounted by four rampant lions on the central ratha. Four squatting figures, which is the characteristic of the Orissan Temples, support its main amalasaraka. Between pilasters, 'Jagamohana', which is known as 'tryanga', and its 'jangha' are relieved with 'pidha-mundis'.Balustrade windows light up the central projections, which are crowned by semi cylindrical roofs at the top. Crowning element consists of only a 'kalasa' without the usual components of the full-fledged Jagamohana, and arrangement of the 'pidhas' is continuous, without any recess. Composed of three mouldings, the 'bada' is 'panchanga' with a division of 'jangha' into 'tala' and 'upara' by the 'bandhana', and the 'deul' is 'pancha-ratha' on plan.